So excited to share the new cover of Wedding Cakes & Sugar Flowers Magazine out 11th April. 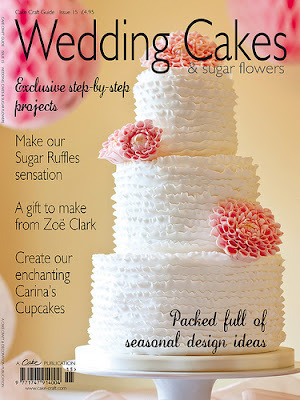 The cover features the ruffle wedding cake with dahlia flowers I created for the magazine with a full step by step guide inside showing how to make the cake, include full instructions for how to create the dahlia flowers and ruffles! The beautiful photography for the cover image and the step by steps are by the very talented Sarah Kay Photography. We had a fantastic day photographing the cake back in November. The magazine is available to order here and also features exclusive projects from Zoe Clark and Carina's Cupcakes. Charlotte - that is absolutely gorgeous! Congratulations! WOW, WOW, WOW, such an amazing cake, Charlotte! BEAUTIFUL!!! The Dahlia flowers are divine and the ruffles are perfect! Congratulations!